OKLAHOMA CITY, OK (12.29.2014) – The name “Jackie Cooper” has been a fixture on the automotive and 12volt scene in and around Oklahoma City for nearly 4 decades. Through several business and economic cycles Jackie Cooper Electronics continued to deliver top brands and customer service for mobile electronics enthusiasts throughout the area. In early December, the company relocated to a brand new, ground-up facility in a growing high-traffic area of Oklahoma City. 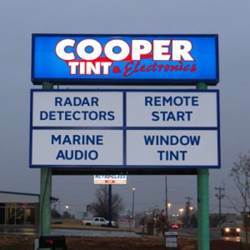 The company has been renamed Jackie Cooper Tint and Electronics to reflect the make up of the business today. A large street side sign draws attention to the new location. Kevin Kelly, who heads the daily operations, has been on board at Jackie Cooper Electronics since 1978. Kelly related to 12voltnews.com, “We are very excited to be in our new facility. We were very fortunate to be able to design the facility from the ground up to fit our business model of window tint and mobile electronics. The overall building is 5,000 square feet with 1,000 square feet devoted to showroom. The modern hi-tech showroom showcases the key product categories very well. Window tint, along with car and marine audio, have dedicated areas with ATV being included with marine. Five large flat panel monitors are available to show vendor messages, music videos and car slide shows plus promotions. The sales counter features a granite top and the showroom is an easy to maintain tile surface. Show floor displays add flexibility to highlight product categories and special promotions.” Donnie and Jill Chaffin are the business principals and work in this and other business interests. Kelly added, “When designing the store we looked at all areas and Jill was instrumental in making sure all aspects of the new facility were ideal for our lady customers too.” Key brands promoted at Jackie Cooper Tint and Electronics include Alpine, Kenwood, WetSounds, Focal and JL Audio. There is a loft office area above the showroom for office and accounting functions. Through the years the company has consistently continued a strong advertising and promotional presence in the marketplace. A key element in the current marketing plan is advertising on a local sports station that includes once a month celebrity appearances and live remote. The current business enterprise also includes two area AT&T stores and the company is the number one producer in the region.